By introducing Essential Aminos, Stacker2 Europe puts a new top supplement on the market! Essential Aminos might just be the best amino acid product in our product assortment with regard to composition and taste. By introducing Essential Aminos, Stacker2 Europe puts a new top supplement on the market! Essential Aminos might just be the best amino acid product in our product assortment with regard to composition, taste and – most definitely – price. Some amino acids are vital for you as an athlete. These are amino acids that your body cannot produce itself. They are called essential amino acids and there are eight of them. Glutamine can be considered the ninth essential amino acid for athletes who place a lot of stress on their muscles. 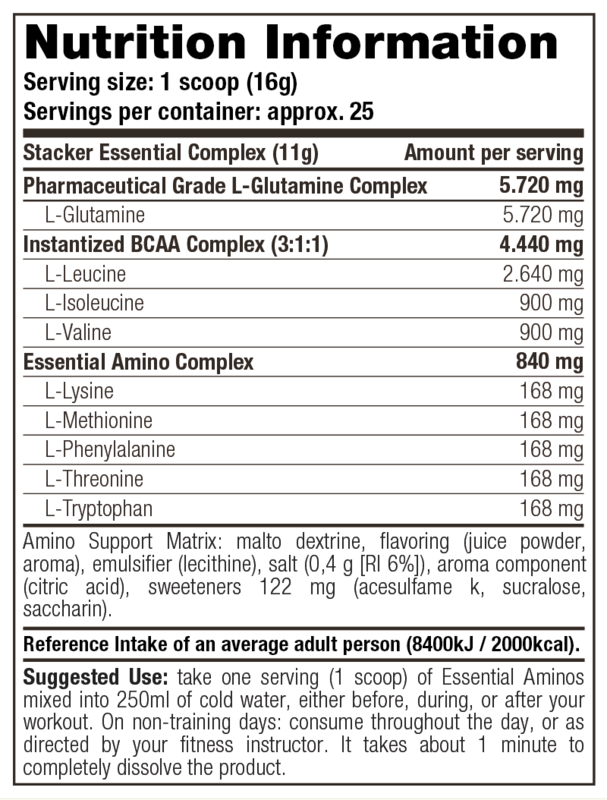 Essential Aminos contains 11 grams of these essential amino acids per serving. The product mostly contains the most relevant amino acids for you as an athlete. Essential Aminos contains no less than 5.7 grams of glutamine and 4.5 grams of BCAAs per serving in the ideal ratio of 3:1:1. The quantity of leucine is therefore three times as high as the contents of valine and isoleucine. BCAAs in the ideal ratio of 3:1:1. As you might know, amino acids are the building blocks of proteins. You need amino acids to help your muscles and metabolism function at optimal levels. A person needs an average of 1 gram of proteins per kilogram of body weight. But if you exercise intensively and want faster recovery, or if you want to cultivate a good deal of muscle mass, then you need 2 to 2.5 grams of proteins per kilogram of body weight. Protein supplements can supply the body’s greater demand for protein, but top athletes and professional bodybuilders need a supplement that is absorbed by the body extremely quickly and reaches the muscles in no time. That’s why they opt for amino acids. Amino acids especially have a great deal of added value right before or directly after training. There are eight essential amino acids, which are amino acids that the body cannot produce itself and that you therefore have to take in through food. Glutamine is viewed as the ninth essential amino acid for athletes. That’s because at least 80% of your muscles consist of glutamine. Glutamine is so important that if you don’t take in a sufficient amount of it, your body will simply break off other amino acids in order to produce glutamine. Even BCAAs have to succumb to it when the glutamine level is too low. And that’s the reason why one serving of Essential Aminos contains almost 6 grams of pure glutamine. Everything you’ve read and everything you already know about the effect of amino acids in your body doesn’t really have meaning until the moment that your muscles have sufficient glutamine. Leucine is the most important Branched Chain Amino Acid (BCAA). Muscle cells respond to leucine in a special way. The more leucine the muscle cell finds, the more intensely the anabolic signal molecule IRS-1 is triggered. In concrete terms, this means that the more leucine is in the muscle cell, the more pure muscle mass is built. Leucine is a much-discussed ingredient; it can increase muscle protein synthesis by no less than 70%. BCAAs have been tested by scientists in regard to performance of strength athletes and endurance athletes for more than 10 years. The research results undisputedly show that BCAAs protect the muscles, have a muscle-building function and can give extra energy. Recent research shows that BCAA supplementation disrupts the production of catabolic proteins such as atrogin-1 and MuRF1. This indicates that the muscle cell experiences less stress, which is seen even more clearly in the measurements of the stress hormone creatinine kinase several hours after training. In these studies, significantly less stress hormone was found in athletes who also used BCAAs in addition to following a proper diet. Now that we’ve explained the functions of the most important essential amino acids, there are five left. Although these five essential amino acids do not play a key role in the muscle recovery or muscle building process, you should not underestimate their function either. Lysine plays an important role in converting fats into energy. Together with leucine, lysine improves the metabolism. Threonine supports digestion and promotes the building of elastin and proteins. After training, the muscle tissue is stretched, and elastin ensures that the tissue is restored to its original condition. Methionine is an amino acid that ensures good metabolism, which in turn allows other nutrients to be absorbed better and faster. Phenylalanine is involved in the production of neurotransmitters in the brain; it positively influences your mood. And last but not least, tryptophan. Tryptophan is a building block of many proteins and is used by the brain together with vitamins and minerals to make serotonin. Serotonin is an important anti-stress hormone and, just like BCAAs, fights catabolism. Essential Aminos can now be purchased in a package of 400 gram and is available in the delicious flavours of Orange, Tropical Fruit and Blue Raspberry. This is a food supplement. Food supplements should not be used as a substitute for a varied diet. This product is to be used in conjunction with a sensible diet and exercise program for best results. Please store in a cool, dry place and keep out of reach of children. This product is not intended for anyone under the age of 18. This product is not intended to diagnose, treat, cure or prevent any disease. Contains artificial sweeteners. Never exceed the recommended serving..